The East Anglian Chess Union decided at their last AGM to award a permanent trophy for the top junior player in the region. The annual Bury St Edmunds Junior Chess Congress, held a couple of weeks ago, was chosen as the event at which the winner of the Open section would be declared EACU Junior Champion. By winning all six games, 15-year old William Sait from Bury St Edmunds has become the first recipient of the trophy. The photo shows William holding the new trophy, as well as the Bury Area Chess League Shield, which is awarded to the player with the best performance who comes from one of the clubs involved in the League. 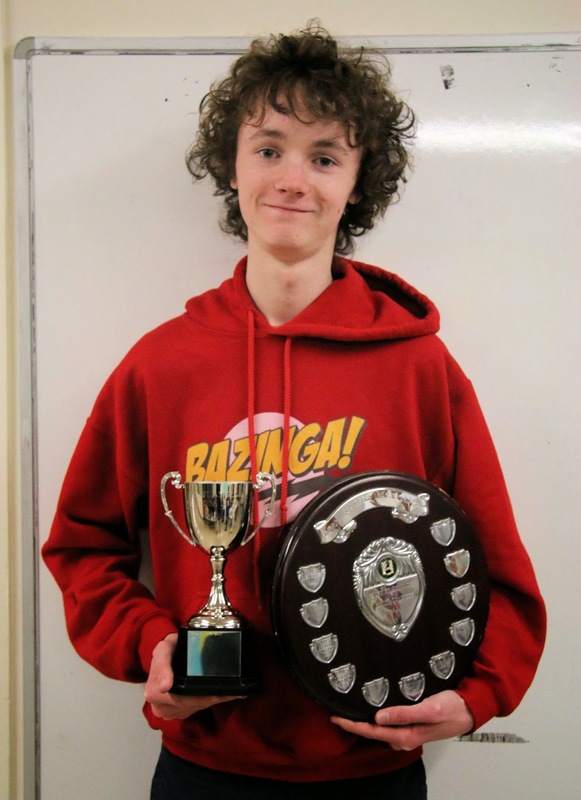 William's maximum score ensured that he won the trophy.